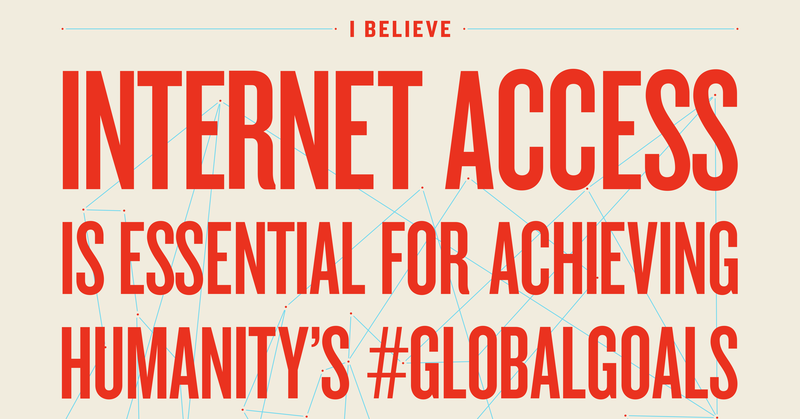 Prominent leaders from the global development community, technology industry, the arts and entertainment joined today in an unprecedented call for world leaders to implement the promise within the newly agreed Global Goals that universal internet access become a reality by 2020! This week, world leaders are gathered at the United Nations to approve the Global Goals, a new global development blueprint aimed at solving the most pressing social and economic challenges of our time. Recognising the indispensable role the internet plays in creating jobs and opportunities, enabling access to essential public services, advancing human rights and justice, and ensuring government transparency and accountability, the Declaration calls on governments around the world to work together with innovators to finally deliver access to every person, every where. The Connectivity Declaration has already been signed by: the Action/2015coalition, Charlize Theron for Africa Outreach Project, Judith Owigar forAkiraChix, Ayaan Hirsi Ali, Bill and Melinda Gates for the Bill & Melinda Gates Foundation, Richard Branson, Erik Hersman for BRCK, Niall Dunne for BT, Danny Sriskandarajah for Civicus, Denis O’Brien for Digicel, Jeff Sachs forEarth Institute, Hans Vestberg for Ericsson, Mark Zuckerberg for Facebook, Hugh Evans for Global Citizen, Arianna Huffington, Josiah Mugambi for iHub, Ashish Thakkar for Mara Group, Mo Ibrahim for the Mo Ibrahim Foundation, Bono for ONE, David Soloff for Premise, Project Everyone, Nik Hartley forRestless Development, Carolyn Miles for Save the Children, Shakira, George Takei, Chris Anderson for TED, Daudi Were for Ushahidi, Jimmy Wales, Omoyele Sowore for Sahara Reporters, Cobus de Swardt for Transparency International, Kathy Calvin for the UN Foundation, and Oluseun Onigbinde forBudgiT. The internet is critical to fighting injustice, sharing new ideas and helping entrepreneurs create more jobs. But right now half the people on this planet don’t have access, especially women and girls. Citizens are invited to join the movement by signing on to the Declaration at one.org/connecttheworld. The leaders of 193 nations formally adopted the Global Goals for Sustainable Development at the United Nations on Friday after years of negotiation. The Goals aim to fight inequality, protect our planet, and end extreme poverty by 2030. 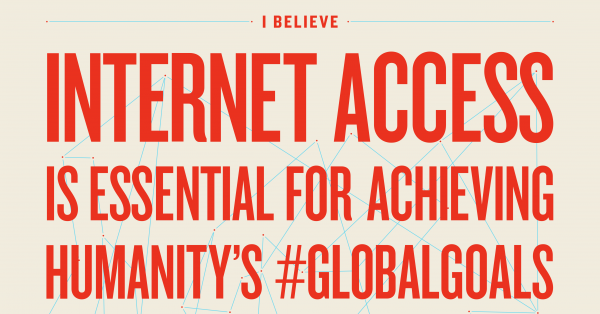 The Connectivity Declaration draws attention to target 9.c of the Global Goals demanding internet access for all in the Least-Developed Countries by 2020. The Global Goals build on the success of the Millennium Development Goals, which helped cut malaria deaths in half, reduced new HIV infections by 40 percent, saved millions of children’s lives, and contributed to a worldwide decline in extreme poverty of more than 50 percent. Learn more about the Global Goals at one.org/globalgoals and follow on #GlobalGoals.